Sniveling... I want a thimble! And a rubber stamp!! 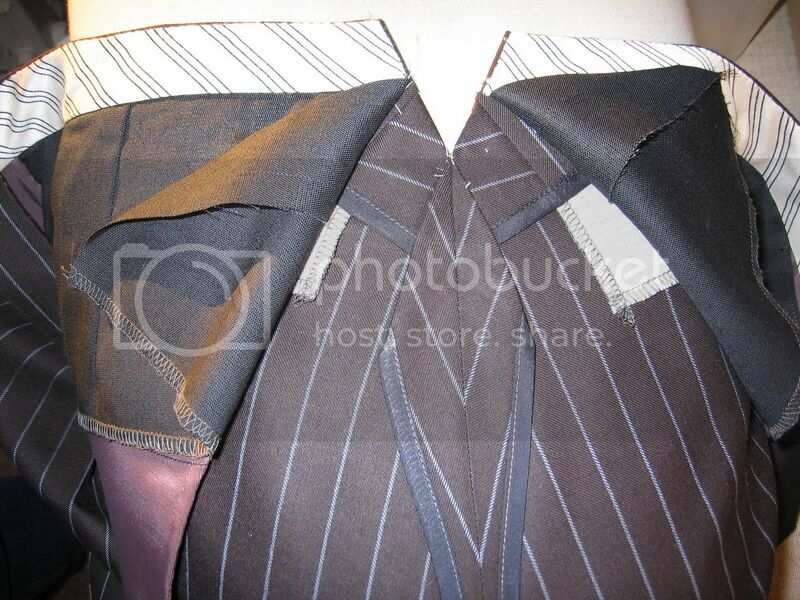 Edited by NW Tailor, 11 December 2010 - 12:05 PM. Yes, very nice work, DZ! So where do I get the labels? 3.5 x 7.0cm sewing inside the coat. Erich Honecker would have said "Weltneiveau"
Who in the world has such thing in the pants, Henry Pole? Edited by Der Zuschneider, 12 December 2010 - 05:07 PM. Vorderhose mit Zugpatte. Very traditional! Even when my thread confuses silence, I am continuing showing pictures. 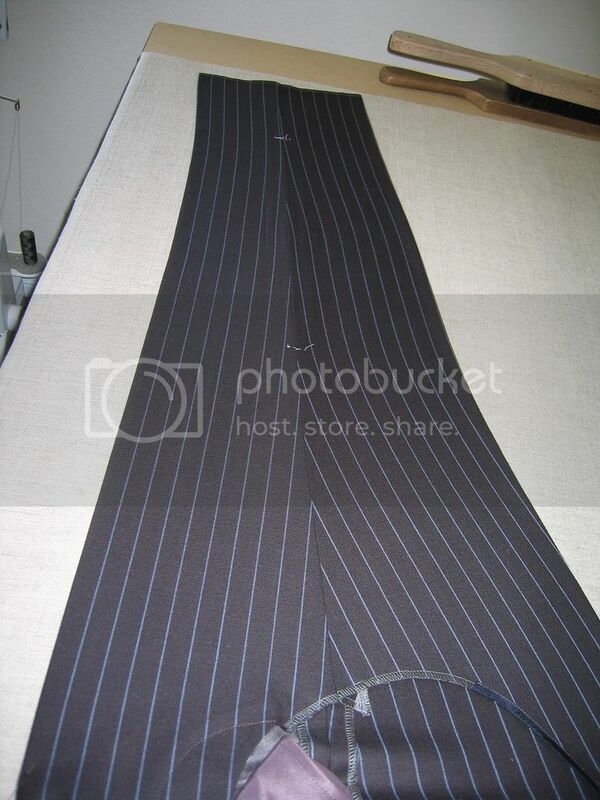 This is how a trouser has to be ironed on the felt mat. See the accurateness of shortness in the hollow of the knee for this loose trouser and width over the bottom. If your trousers don't look like mine here they are not ready iron dressed. Forget about all those nonsense ironing trousers parts alone like a sorcerer in the pictures we see always in the literature, you hardly don’t get that. My master explained the shortcut to me 20 years ago. I doubt that there is any chance with a 3 pound 500Euro Iron steamer and small sucking table to get those results. I am working with 60 and 75years old 6kg and 8kg dry irons on a felt mat like the tailors used to work traditional. I also don’t use any Teflon equipment. We're not confused, just enjoying the pictures. For my next trousers I make changes, this trouser looks so old fashion from the 30thies, I saw my Grandfather and my father wearing such pants. 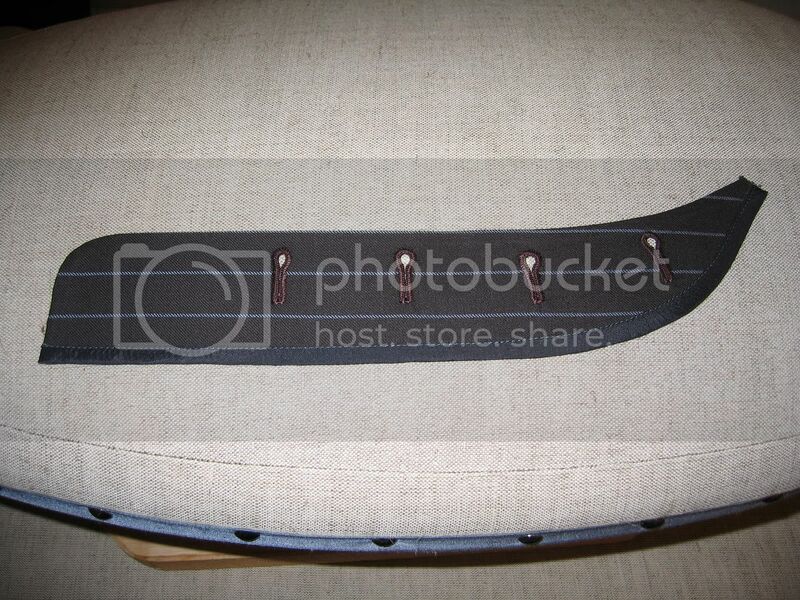 They are very comfortable with the ease over the buttom and waist, hold by suspenders. People will look weired at me... But they are my most comforatble pants now. I can even eat a little more there is still a little room in the front. Very nice trousers. Is that the mat you were sourcing awhile back with a felt supplier? How's it performing? Would you mind posting a pic of your iron? I'd like to see if mine is similar in size. I haven't used it yet since I haven't got a mat. Very tidy and beautiful done! 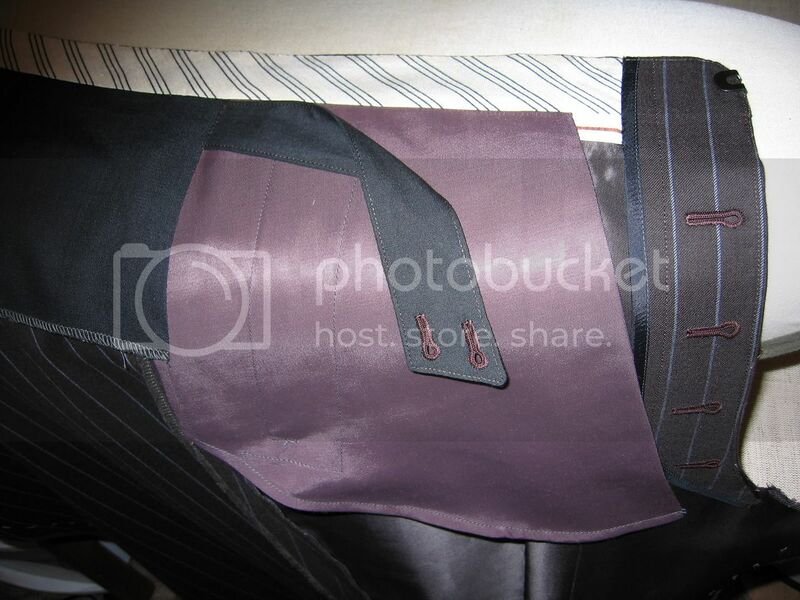 If it is possible - could you take a picture from the place where the curtain is fastened over the pocket lining? But not like you have shown it. 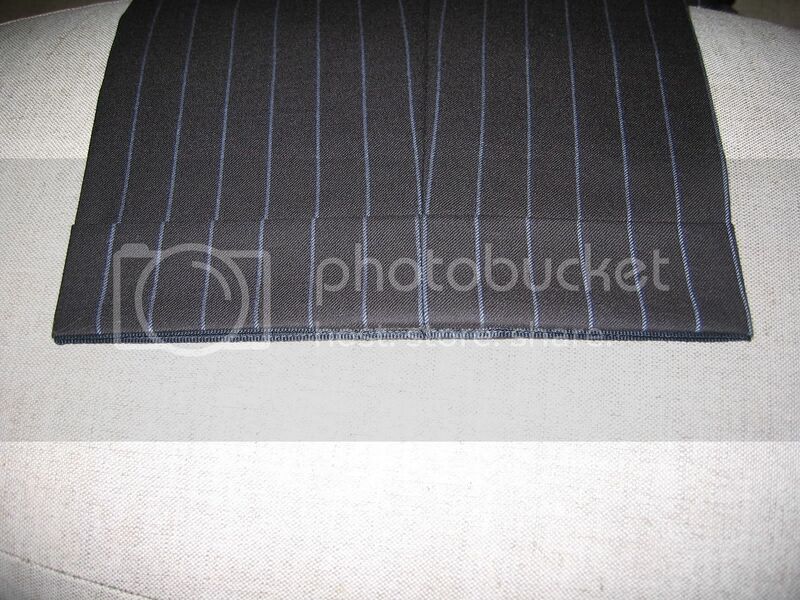 A picture with the ready pocket and how do you fasten the curtain there. But maybe with the next trouser. It may be to late now. I have NO idea where one might get labels overseas... I have all of my custom labels done at PCB Label (link below) ~ they aren't cheap, but... love that I can provide long-time clients with individual customization. I would assume they'd ship international? Whether you make one piece or thousands, you are required by the FTC to put care, content and country of origin labels in your garments.